These ancient reptiles may have injured themselves during long deep-sea dives. The giant dolphin-like ichthyosaurs first appeared over 245 million years ago in Earth’s oceans and would have made numerous deep-sea dives during their lifetimes. But this practice may not have been healthy for them, as deformities found on the fossilised remains of an ichthyosaurus skeleton seem to be similar to the lesions developed by human divers suffering from the bends. The question is, how did it happen? 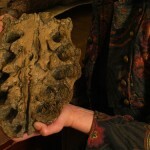 The group of scientists from the University of Kansas in the US, who identified these lesions, suggested that they might have been the result of the dinosaur surfacing too quickly from deep dives. “Diving in the Triassic appears to have been a leisurely behaviour until the evolution of large predators in the Late Jurassic that forced sudden depth alterations contributed to a higher occurrence of bends,” they said in the study, published in Naturwissenschaften: Science of Nature. However, associate professor John Hayman from the University of Melbourne has suggested that the reptile may have developed these lesions while spending too much time at deep depths, rather than making quick ascents. He has conducted several autopsies on human divers and says that their lungs rupture after a quick ascent; they do not develop the bends. Marine reptiles would have dived with one atmosphere of pressure in their lungs and surfaced with the same pressure, so they would not suffer from sudden ascents. “However, when at depth their lungs are compressed, air in them is under pressure and the deeper they dive and the longer they stay down the more nitrogen goes into solution,” Hayman explains. “This comes out of solution after several hours at the surface, and it is the nitrogen bubbles that produce the bends and the bone necrosis. The dangerous practice of deep sea diving wouldn’t have affected the reptiles’ long-term survival, Hayman states in his analysis, also published in Naturwissenschaften: Science of Nature, as any ill effects would have developed later in life. “The lesions wouldn’t have been enough to kill the animal, and wouldn’t have affected its ability to hunt or breed,” he says.